So you just went out and splurged on the latest and greatest gaming mouse - a Lachesis, or maybe a G9, or perhaps you pre-ordered a Salamosa. But you're disappointed - despite those luxuriously slick, ginormous teflon feet (that's what PTFE, or polytetrafluoroethane means, by the way) feet, it's not as smooth as you'd expect. 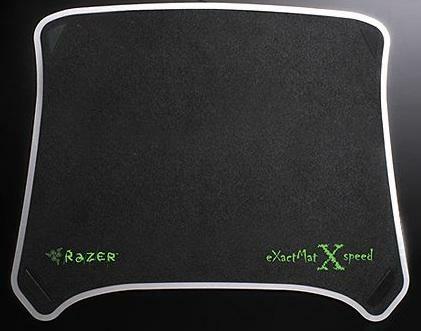 That discourtesy mousepad that came with your computer is what's holding you back. But... what do you do? Well, for starters, you ask a lot of the same questions you asked when you picked a mouse. How do you use your mouse? Low sensitivity, or high? 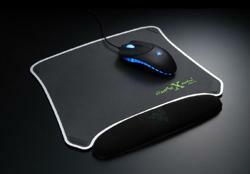 Low sensitivity players often prefer bigger mousepads, to allow their Picasso-like giant sweeping strokes of the mouse. On the other hand, if you like turning your sensitivity up to 3200 DPI and moving the mouse with the tips of your fingers, you can probably get away with a much smaller pad. Also, where do you use this thing? Do you play at home on a monstrous gaming rig that never goes anywhere - with a desk to match, or do you have a laptop that you carry to every LAN party you can find? The truth is probably somewhere in between, but they're both useful to consider - laptop uses tend to favor hard pads, which can give you a mousepad bigger than your desk space, if the hangover isn't too bad - but more important is the ability to have a flat mousing surface where otherwise you'd have to contend with a pant leg. With soft pads like the Fatality "FatPad" or the X-Ray Aqua pad, a good pad will be stable with part of it dangling, but you can still fall off if you expect the pad to extend for another few inches. Once you've decided on the basics, you can start looking for something perfect for you. I've used and can recommend the Ratpadz GS and the Razer ExactMat hard pads, and the X-Ray Aqua softpad - easily the absolute best I've ever had the pleasure to use. But I'm not here to tell you what to buy, I'm here to tell you why I liked it. In the name of full disclosure, I tend to play at fairly high sensitivities, and don't move the mouse much - if things go well. I also spend a lot of time on the receiving end of a rocket-launcher blanket party, unfortunately, and big pads give you room to dodge without re-centering your mouse. So, my first secret is this: Always get a bigger pad than you think you need. It'll usually come in handy in dire straits, often by giving you room to respond under pressure when you've cranked down your sensitivity for sniping - nobody expects you to turn around and whip off a headshot with the lightning gun when they charge with the flak cannon.